I’ve had the photo above for quite some time. When I first got it, I thought, it’s Pigeon Point, then I thought I’ve never heard of the Beadle Bros: It couldn’t be Pigeon Point! I just saw the picture of the Beadle Brothers on your website. If you were wondering if it is at Pigeon Point I can tell you that it is. 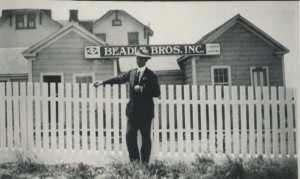 The Beadle Brothers ran a sawmill in the Gazos canyon from 1916 to 1920. They shipped their lumber from Pigeon Point. 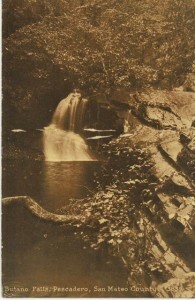 More info on the subject can be found in Harvey Mowry’s book, Echoes From Gazos Creek. Glad I could help. I will send along a little write up from Mowry’s book about the Beadle Mill. A few pictures can be found in his book. 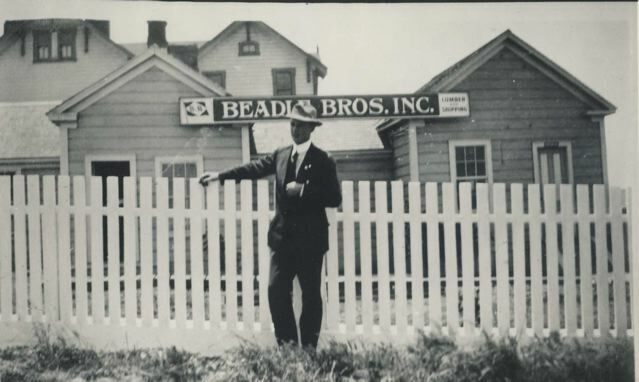 One is at the Beadle Mill in 1916 with Albert Beadle and the Littlefield’s, whom they were friends with. Another photo is of George Beadle and Mary and Charles Littlefield. There are also some machinery pictures used at the mill. The picture you have is most likely one of the Beadle brothers, George or Albert. I will bet it is George since Albert died in 1916 at the start of their business venture in the Gazos canyon. You can find the book at most libraries or buy it at the San Mateo County History Museum. I was excited to see the photo because I am doing research on the Butano State Park history. I work as a seasonal interpreter, and last summer took on the project of updating the park’s history files. Not worked on since the 1970’s, i have managed to organize and add to the info already collected. This year I’m continuing the project and am looking for new material. I have enjoyed your books and amazing local history knowledge. If you have any more photos and/or information on the Little Butano and Gazos canyons I would love to see it. The two canyons within the park, the Little Butano and Gazos, have some great history and are different from each other. I will be working at the park all summer so feel free to contact me. I would also be interested in obtaining a copy of the Beadle Brothers picture for our records. Let me know. Do you have history of The Butano that you’d like to share with “Mountain” Mike Merritt, who is the Butano State Park’s Seasonal Interpreter? This entry was posted in "Mountain" Mike Merritt, Pigeon Point Lighthouse, The Butano, Uncategorized and tagged Butano State Park, Pigeon Point. Bookmark the permalink.